What had we done to deserve this, a second sunny day on a bank holiday weekend? At least, if you don’t live in the west of the country, it was sunny – the forecast seemed to be cutting the country in two – though it was quite windy, too. 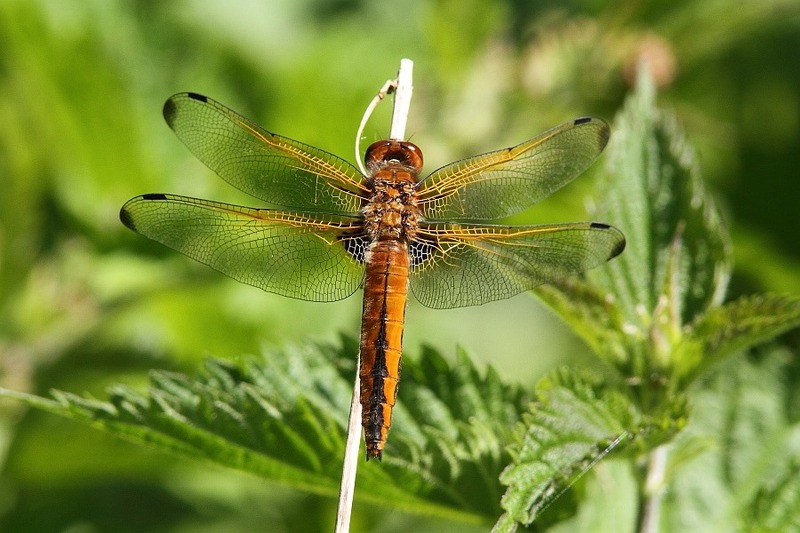 I’d seen some interesting dragonfly records being entered from a section of the Great Ouse river, which was new to me, so I absconded from the paper hanging once again and we decided to investigate Roxton, just south of the nastily busy black cat roundabout on the A1. As ever with new ground, I had little information about precise location but we found Roxton itself, a quiet, sleepy little village, navigated a few single-track roads – grass growing down the centre of the road is always fun – and found an apparently suitable parking spot. In fact, it appeared to be the only suitable parking spot and it was empty. Maybe we’d succeeded in avoiding swarms of people on this bank holiday again? A handy-dandy footpath sign indicating the direction to “Roxton lock” gave us a clue and off we set. 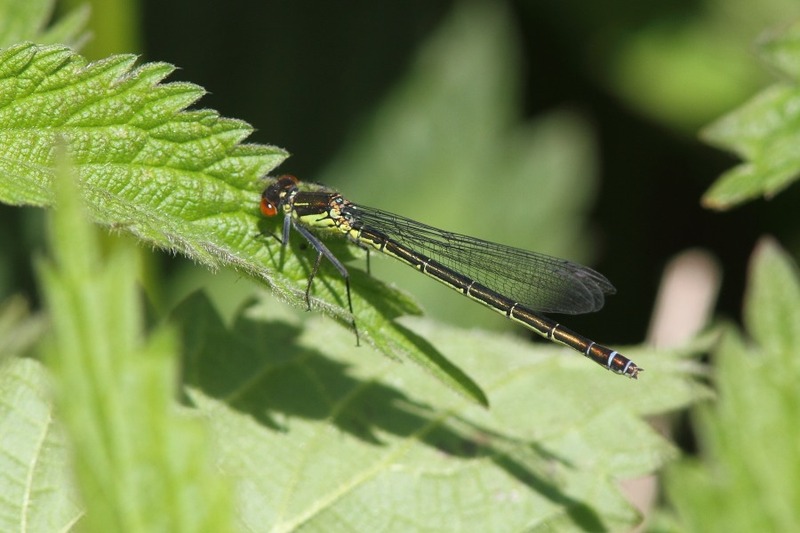 A couple of Large Red Damselflies (Pyrrhosoma nymphula) flittered in some nettles beside the path. They were some way from the river but there are also a couple of seemingly private fishing lakes to the side which I imagine is where they emerged from. 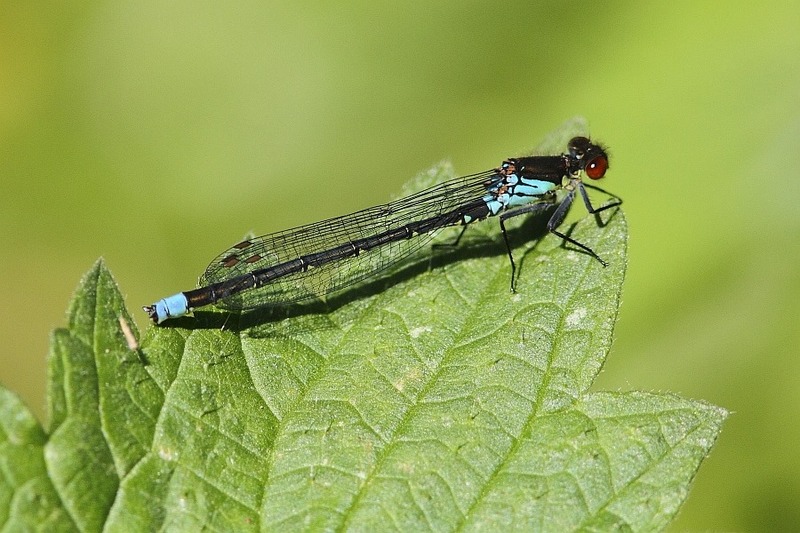 Continuing slowly, we soon added several Common Blue Dams (Enallagma cyathigerum), Blue-tailed Damselflies (Ischnura elegans) and a lonely (poorly positioned) Banded Demoiselle (Calopteryx splendens). 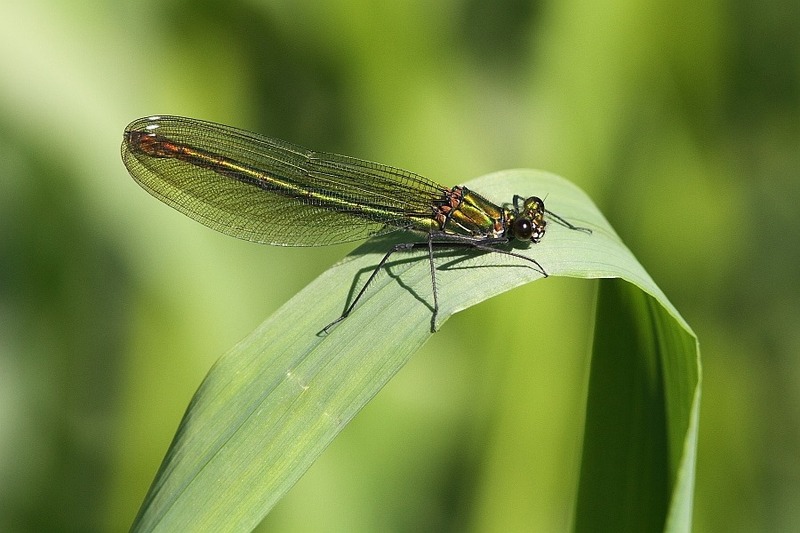 The Blue-tails and Demoiselle were our first of this season so I was already a contented camper. 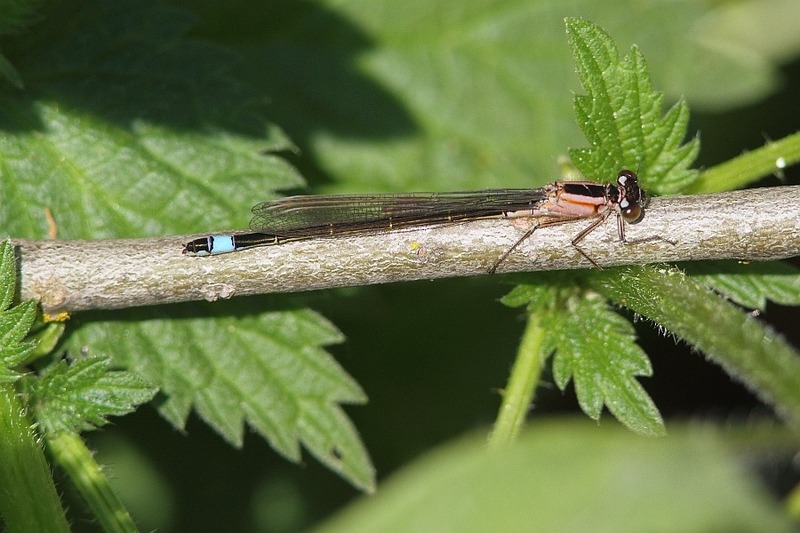 Blue tails may be my favourite damselflies, largely because of the variety of colour forms of the females. This specimen is a very neat looking f. rufescens. At a widening patch of sunlit nettles, Carol shouted the immortal phrase, “big boy!”. Well, what could she possibly have meant? It’s a good job the man walking his dog hadn’t been closer, sooner. 😀 The cause of her unseemly outburst was two dragons, which looked a bit mosaic to me as they flashed past at a rate of knots. Anything looking mosaic at this time of year had to be Hairy Dragonflies (Brachytron pratense). 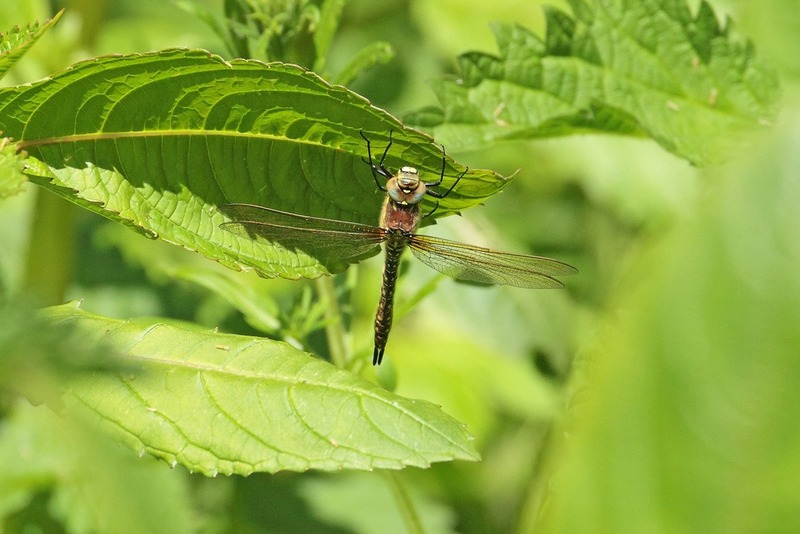 I’ve seen only one before in my short dragonfly career so excitement was high. The dragonflies split up so we followed suit. I chased one which promptly disappeared. Carol’s subject settled briefly but rather uncooperatively. However, she did manage a recognizable picture on her only-one-day-old, shiny new Canon EOS 60D, so well done to her. Staying with the nettle bed, more fortune arrived in the shape of an orangey dragon. I was beside myself now. It landed right in front of me as I stood in the nettles with trousers that were clearly too thin to offer protection. Nonetheless, I wasn’t about to miss this golden opportunity. 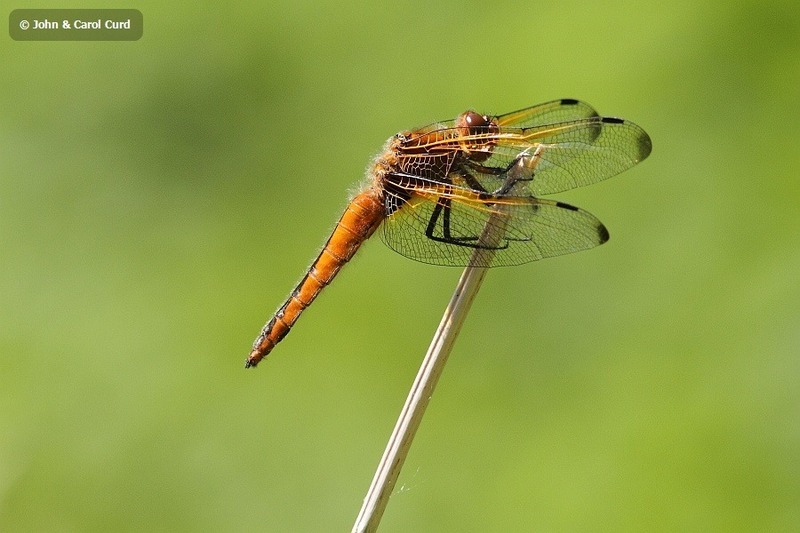 I’ve seen only one female Scarce Chaser (Libellula fulva) before and she was half-way down France. This was my first UK example and she posed long enough for a clear plan shot, given a little getting stung and stretching by yours truly. Then she went further down our track where she posed for a good side view. Unbounded joy! 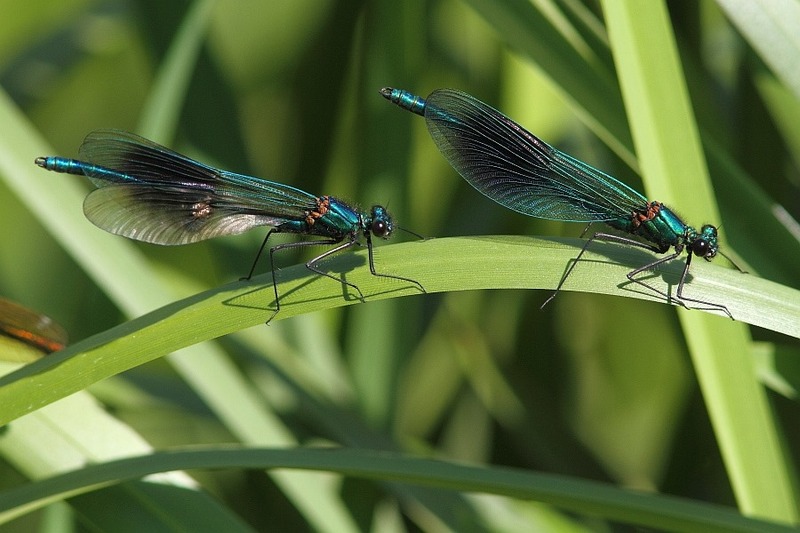 Finally, we hit the river and found the mother-lode of Banded Demoiselles (Calopteryx splendens), where two males posed for an interesting combination picture. One seems to have a slight blemish on its wing but it wasn’t having any trouble flying and displaying. A female posed shining brilliantly in the sun, too. Further down the riverside path we hit another mother-lode, of Red-eyed Damsels (Erythromma najas) this time. “Why just here?”, I wondered, as I watched them in the ubiquitous stinging nettles, getting stung yet again all the while completely missing the fact that here were the only lily pads in this stretch of the river. Duh! We counted about ten, though I’m sure there were more. 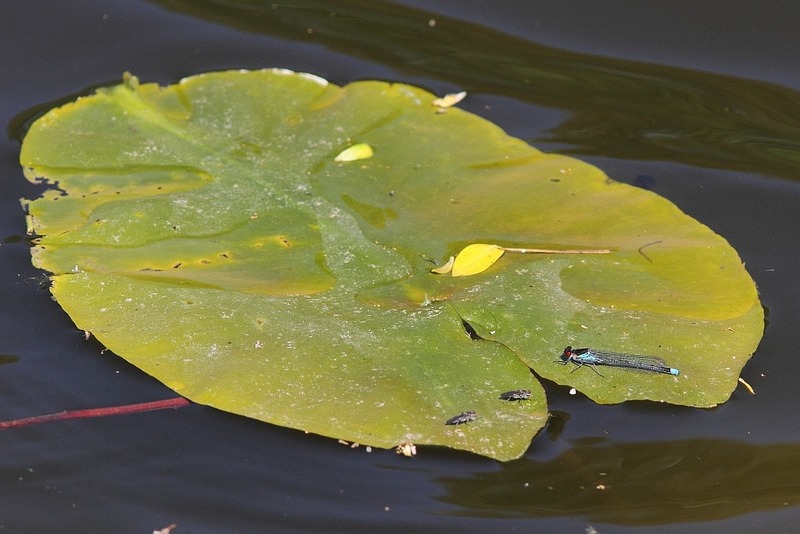 I sagged a decent male and female specimen – they really are delightful damselflies – and I couldn’t resist a distant shot of the classic Red-eye on lily pad pose. Retracing our steps, the sunlit nettle bed appeared to be now almost deserted. It’s all about timing, isn’t it? Either that or my trampling it to get an angle on a truly scarce female Scarce Chaser upset everybody.